In this tutorial we’ll take a quick look at using the position tool to add space between clips, overriding the FCPX magnetic timeline. I first saw the magnetic timeline when FCPX was demoed at the Supermeet in Las Vegas back in April… and like many of the editors in the room I was initially impressed. A “smart” timeline that automatically adjusts as you edit? It sounded interesting to say the least. I had visions of future Final Cut Pro X edits moving quickly, like a more synchronized dance between editor and software. It was perhaps this feature, above all the others showcased, that I was most excited about. 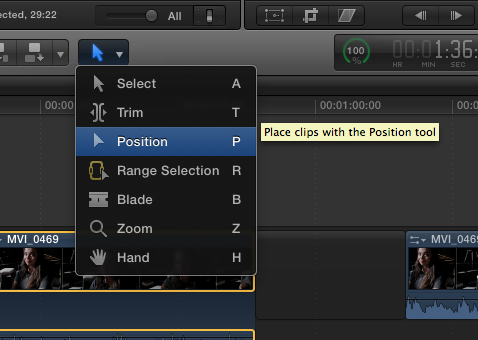 The Position tool will allow you to move clips around the timeline without them snapping to each other. You can create gaps between clips, as well drag a clip over another to override it. To switch from the Select tool (the default) to Position, use the shortcut Command +P. Note: Although I always recommend using shortcuts, you can also pick the Position tool from the toolbar drop down list). Now this is more like the FCP I’m used to. FCPX’s magnetic timeline presents a new way of working that we haven’t previously seen in digital NLEs. Naturally, it’s going to take some getting used to. I expect that as time goes on I’ll continue to be more comfortable using the Position and Select tools in conjunction with one another…utilizing the magnetic timeline to it’s full potential. Until then, it’s nice to know that when time is short I can fall back on what I know best, by using the Position tool shortcut. Do you like the magnetic timeline? Do you find it is a time saver? Makes your edits smoother? We’d love to hear in the comments!